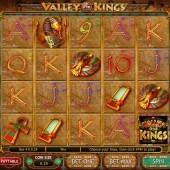 If there's one theme slots developers constantly go back to like a comfy old armchair, it's the world of ancient Egypt. Whether it's the mega-popular Egyptian history-based Book of Ra series from Novomatic, or IGT's fun take on the theme, Crocodopolis, as long as there are online slots there will be online slots about the Pharaohs, Great Pyramids and mummies. The Hunt for Buried Treasure Is On! Not wanting to be left behind, Gamesys's release, Valley of the Kings - a 5-reel, 50-payline slot - sees you on the hunt for ancient buried treasures as you delve into the catacombs. As for the graphics, it's what you'd expect from a slot set in Egypt: plenty of gold and stone everywhere, and Tutankhamen's head, golden ankhs and birds, and the usual 9-through-Ace card symbols adorning the reels. In the background are some nice echo-y tomb noises for atmosphere. The long sarcophagus symbol is the game's Wild and substitutes for all symbols other than the Scatter. As the sarcophagus covers the entire reel, and only part of the symbol is needed to activate it as a Wild, it can lead to regular wins. The Valley of the Kings game logo acts as the game's Scatter. Three or more of those on the reels activates the free spins round, where up to 10 can be won. During each free spin, getting any part of the sarcophagus in a column will make it expand to fill the entire reel, meaning you can bag even more cash. Get another three Scatters during the free spins and you can get yourself another 10 free spins! While most slots with an Expanding Wild feature it during the base game rather than just the bonus round, I'd have liked to have seen that happen here. 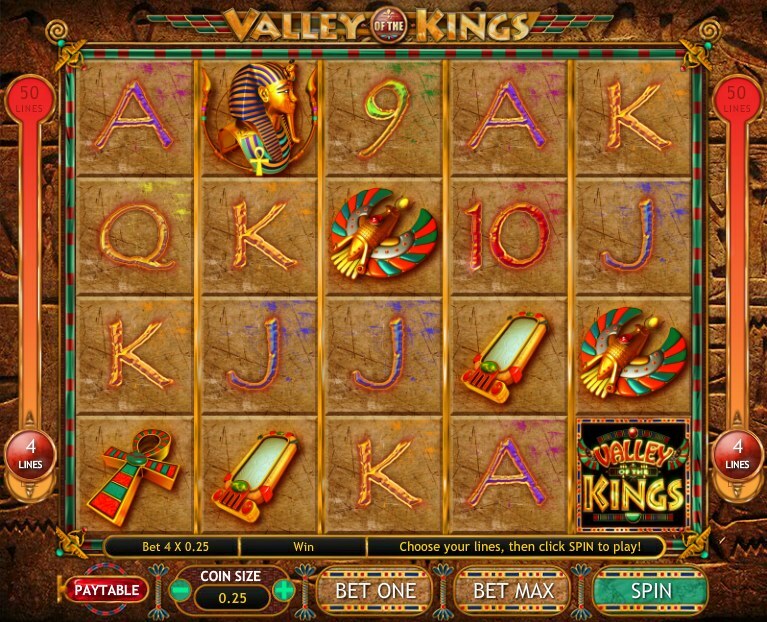 As it is, Valley of the Kings is diverting enough for Egyptian theme fans and probably worth a punt for everyone else looking for quick, regular wins.